Antigng added a comment to T161595: Allow users who can remove but not add a right to shorten userrights expiry. > Anyway, anyone with a real use case is very much invited to re-open this task and explain their case. Antigng updated the task description for T187975: Abuse logs not moved under the new username after user renaming. Antigng created T187975: Abuse logs not moved under the new username after user renaming. Antigng added a comment to T180485: Inputbox does not support variants conversion on Chinese sites. This seems to be a side effect of this commit. Antigng added a comment to T171813: Error occured when viewing difference on conversiontable page. The supplied ParserOptions are not safe to cache. Fix the options or set $forceParse = true. @Antigng: So did you fix your options? What was $forceParse set to? If it was not true, did setting it to true fix this? Antigng added a comment to T175338: Fatal: Wikimedia\Rdbms\DBQueryError on Special:AbuseFilter/examine: "Error: 1054 Unknown column 'rev_id' in 'field list' (10.64.16.191)". The problem seems to be a side effect of this. Antigng updated the task description for T171813: Error occured when viewing difference on conversiontable page. 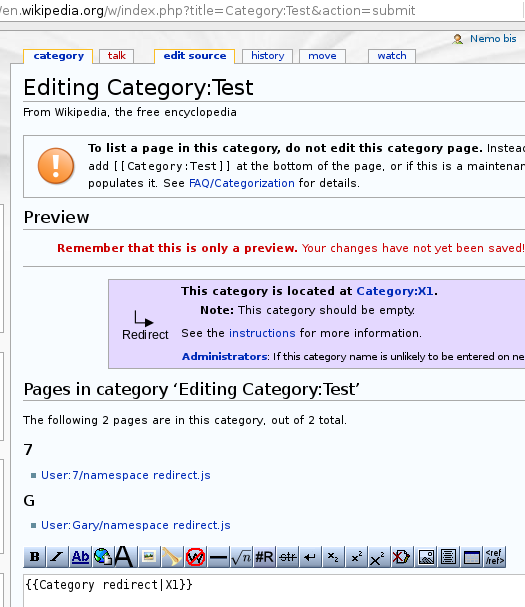 Antigng added a project to T171813: Error occured when viewing difference on conversiontable page: MediaWiki-Parser. Antigng added a project to T171813: Error occured when viewing difference on conversiontable page: Parsing-Team. Antigng created T171813: Error occured when viewing difference on conversiontable page. Antigng created T168427: Characters in CJK extension C treated as U+FFFD when searching on zhWP [EPIC-ish]. Antigng added a comment to T43720: DISPLAYTITLE of a page not applied on the page itself for page title and category headers. Antigng added a comment to T144865: Add pageview stats to the action API. Yeah. Someone reported this on zhWP's village pump. Do you mean in preview mode? It didn't change anything on the edit page. However, it did change the subheading on the submit page, which had been "Pages in category 'Test'" before your patch was applied. This change completely breaks our category subheading displaying mechanism. 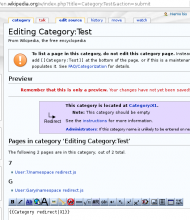 https://en.wikipedia.org/w/index.php?title=Category:Test&action=submit gives "Pages in category 'Editing Category:Test'", and https://zh.wikipedia.org/zh-cn/Category:2016%E5%B9%B4%E8%8B%B1%E5%9C%8B%E9%AB%94%E8%82%B2 gives "分类'分类:2016年英国体育'中的页面". Antigng added a comment to T128263: Change Password on Beta failed. I was getting the same error on Chinese wikipedia when I tried to change my password. Antigng added a comment to T126724: mw1.27#wmf13 update breaks GlobalReplace: "result: WrongToken". https://github.com/fastily/jwiki/blob/master/src/jwiki/core/Auth.java#L37 Jwiki doesn't handle the token properly. Antigng added a comment to T124252: NEED_TOKEN error spike when 1.27-wmf.11 SessionManager was deployed to group1. Login works well enough now, but bot sessions are much less stable than they used to be. Far too often, the bot either gets logged out or starts receiving error messages in the middle of a run. The most frequent error is "Invalid token", but I have also seen messages saying that "Wikipedia is in read-only mode". If I break the run and start over, everything works fine again. Antigng added a comment to T118567: Problems encountered when enabling Flow on Chinese Wikipedia. Also, User:Markmingjie failed to restore his flow archive today. Antigng updated the task description for T118567: Problems encountered when enabling Flow on Chinese Wikipedia.